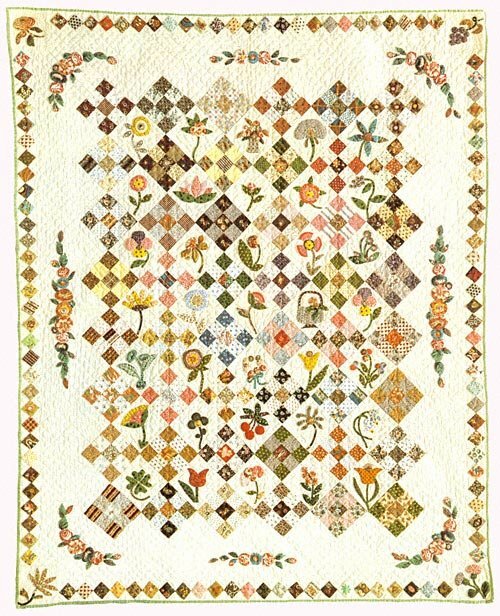 This little beauty of a quilt, with whimsical appliques dotting the plain blocks and borders, was originally made by quilt historian, Florence Peto. Measuring 39" x 49" over all, the small Nine Patches offer a wonderful opportunity to showcase some of your favorite fabrics. Many of the fun appliques are "broderie perse," in which case you are only limited by your imagination! This makes a special baby quilt or decorative wallhanging. Truly a quilt to satisfy your creative urges for a long time! This pattern includes line drawings of each of the 39 three inch applique blocks, all printed on freezer paper, along with instructions for hand and machine piecing. Check out the Teeny Tiny Traveling Tote designed with the Calico Garden Quilt in mind!